Heart disease is often thought of as a man’s disease, so you might be surprised to learn it is actually just as prevalent amongst women. Although only one in five women in America believe heart disease is the greatest threat to her health, heart disease is actually the number one cause of death for women in America. What are the facts when it comes to heart disease and women? Women have a 50% higher chance than men of receiving the wrong initial diagnosis following a heart attack. 80% of heart disease and stroke events may be prevented by lifestyle change and education. Heart disease is a term that is used to refer to the whole spectrum of heart conditions, a range that includes congenital heart defects, arrhythmias, or a hardening of the arteries. These conditions frequently lead to life-threatening events such as heart attack or stroke. There are a number of risk factors for heart disease, the most significant one being age, with heart disease affecting 85% of people over 80 years old. Lifestyle and behaviors including smoking, poor diet, and stress also contribute to heart disease. Learn more about heart disease here and how to lower your risk here. Hypertension is a major risk factor for heart disease and stroke – so much so that it’s known as a “silent killer” as it often has no symptoms. What is hypertension? How does it contribute to heart disease in women? Hypertension, also known as high blood pressure, is a condition that is affects 1 in 3 adults in the United States, nearly half of this population being women. High blood pressure is a disease in which the blood flows through your arteries at higher pressures than normal. New ACC/AHA Hypertension Guidelines have recently lowered the upper limit for healthy systolic blood pressure from 140 to 130, meaning even more women are at an increased risk. Studies have also suggested that compared to men with the same level of hypertension, women have a greater instance of resulting heart disease. When your blood pressure stays within a healthy range you reduce the strain on your heart, arteries and kidneys, keeping you healthier for longer. The best way to ensure your blood pressure is within a healthy range, and not putting you at risk, is to know your numbers. You can do this through frequent measuring of your blood pressure. Don’t wait until your annual doctor’s visit to find out you have a problem. 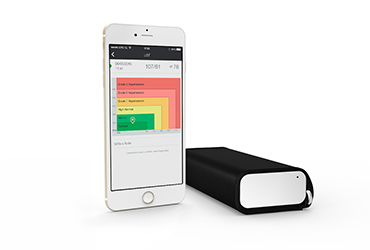 You can easily take regular measurements from the comfort of your own home with QardioArm, wireless smart blood pressure monitor. QardioArm is clinically validated and FDA approved to give you results that you and your doctor can trust, all while remaining stylish and discreet enough to fit into daily life.